I wish I could watch more of Dhoom Macha De (NDTV Imagine, Thurs-Fri 8:30pm IST) - it seems like a show worth quite a few laughs. Take Jasbir Jassi for instance. On an episode I once watched our man whole-heartedly supported his competitors. During someone's song, he played the dafli, during another he danced, yet another was greeted with maracas. Then Anaida came on stage and did what can only be described as a Writhy Nagin Belly Dance. Cut to Jasbir clasping his palms between his knees and wearing a Bhais Ki Poonch expression on his face. The mix of personalities on DMD is an excellent one. Too bad the producers lack operational creativity. Thus each week, one is subjected to the same competitors doing the same shtick like say Baba Sehgal comes and does some bhangra-rap and tries to rouse the audience by telling them to put their hands up (clearly he has never performed in a 7-11) and Jaspinder Narula tries to balance classical mujra singing (I know there is a technical word for her style but I'm not a Ph.D. in music) with more SMS-generation performances. Yet fun ensues. Last week that Devang Patel showed up. Given that the entire reputation of my gujju brothers rests on his shoulders these days, I'm still not sure why Gujarat hasn't already declared a state of emergency. But then who can figure out how governments work anyway? The man did such a joyless nakal of Bappi and Himesh that I laughed and cried. Know of any show that can do that? However credit where its due: I am developing a fierce appreciation for Malaika Arora. The more I try to find things to dislike about her, the more I end up enjoying her presence. How does she do this? Primarily by somehow walking the line between skanky and classy and teetering on the edge enough times that you realize she might be doing it deliberately. And she maintains a hugely peppy and light-hearted presence on the show - doing everything full tilt like hosts are supposed to and even copiously flirting with the audience. Often she'll say tremendous things like "Keep Rocking!" or "All you Happy Hearts!" wearing an expression that seems to say: "I'm hot and you are so lucky to be watching me". Ten out of ten, god bless. And finally time to check in on Richa Sharma, the real reason I watched this show to start with. Every week she proves to be a fine performer, the pick of the lot. She's lovely and versatile. But something strange has been going on with her. Whenever she stands attentively to listen to the judges comments, she's all humility. But there is something in the way she looks at the judges, her face an immobile mask, and nods at everything they throw at her, that you realize she's barely suffering these fools. Often I've thought "Ok, now she's going to throw that goddamn mike at Prasoon Joshi's head" - a possibility I still hold out hope for. You know the word "diva" gets thrown around a lot these days - anyone who opens her mouth to sing pretty much becomes one. But Richa Sharma is a true diva - entitled, enabled, talented, larger than life and hugely dangerous. If I were Bappi, I would hold her hand and tell the world "Tum Eendiya ka Toony Souprano hey!" Yay finally. I am not the only one who's watching DMD. But ya, Richa Sharma is a true smug diva, as she should be (she backs it up everytime). Methinks she was waiting for the opportunity to be 'The Billo Rani'and itrao a little. Still the best reason to watch DMD, barring the eloquent gracious judges. "true diva - entitled, enabled, talented, larger than life and hugely dangerous"
Aspi, this definition is tremendous and bang on! Divas are great entertainment as opposed to the more taciturn, grounded and matter-of-fact personalities. However, if you know one in real life.... whew! I have always wondered why some people (..alright i admit it, some women) induce in me a self protective instinct to wrap myself in the aloof bubble and watch from a safe distance. ..duh! they were a Diva! usually i'm always up for richa, but am strangely reluctant to check this one out. i may be all reality show-ed out :). tried checking out rock and roll family this weekend, but didn't last past one family....perhaps its a good thing i have reality show fatigue. maybe now i'll finally start making a dent on my netflix Q. gajji's OTT Chotte ustaad may have pushed me over the edge. Aspi, loved the review. As usual, Im glad I am not watching the show, cos reading about it is more fun. I 'm waiting for the RocknRoll write-up u promised Joules.I saw about 3 minutes, and changed channels. But then its such programmes that can make ur posts even more interesting isnt it:). thanks Aspi. one more interesting article Now I will catch a few episodes of DMD. I really like Richa's voice. Also like Jaspinder. Not a big fan of Malaika. U can put me on the eargerly awaiting rocknroll write up list. cudnt watch the show for more than a minute. You have really got me interested in Richa Sharma. I remember seeing her on Antakshri and always thought she had a powerful voice. Her two popular songs I can figure (from Google) are Mahi Ve and Billo Rani. What else has she sung? 'chandni raatein'..was released quite some time back.i really like that song. i think even 'jag soona soona lage' from OSO was sung by her. Joules, Richa has sung some of my favorite songs: two of which you've listed. She did "Show me your jalwa" from Aaja Nachle and her version of Lambi Judai from Jannat is something I'm digging a lot lately. 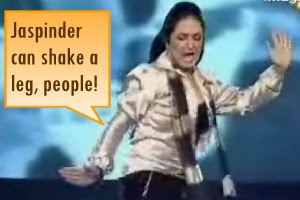 Recently she also did "Dhokha" from Manorama. And she had a killer pairing with Mahalaxmi on Chalka from Saathiya. A somewhat complete list of songs here. Sidekick, u said u r reality show-ed-out:).Just wait until u hear of this new show called 'Kisko Milega Cash'. It is the heights, rather the depths of shows. I refuse to watch it, but the promos r upsetting. There r 3 contestants fighting it out for the cash prize. They r supposed to give their sob-stories on tv, and then there is a grilling session by the judges and the co-contestants(I think Renuka Shahne and Nina Gupta r the judges) and finally the audience has to vote for the person who deserves it the most. This is what i understand from the promos. But I felt terrible watching people crying on stage explaining why they need the money the most.The promoters may say its a good way to get some money for those who want it, but imagine having to enact it in front of everybody,justify why they need it more than the others, and then ask for votes. Its even worse for the contestants who lose!I cant take it:(. anu g, that is truly awful! the very premise that participants ought to plumb the depths of misery to make money is reprehensible, but it's actually worse. it seems that all these "reality" shows are scripted, edited and the "audience" reaction at the staging choreographed to jerk viewers around. that is to me the most troubling aspect. between the article that the drift memsaab found on the "audience" and the chotte ustaad gajji melodrama, i've been feeling very rebellious at such blatant manipulation. sidekick, I wish I had your passion for issues and intelligence to pursue them - I'd write something about it all. I think the reality shows risk audience loyalty by the very shenanigans they use to court it. But shows in which talent is not on display are the hardest ones to watch (not that anyone is forcing me). Take RNR Family for instance. Where is the entertainment in watching some really bad dancing?